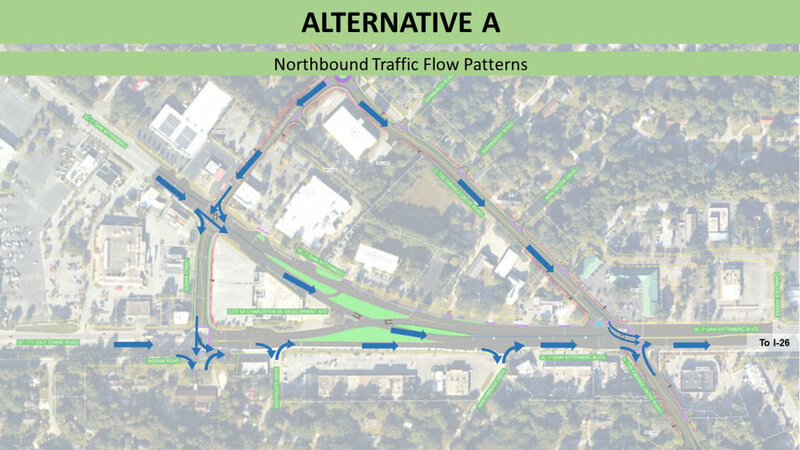 Removes the alternate merge by modifying the lane designations for Sam Rittenberg Blvd. One Sam Rittenberg Blvd. lane becomes the left-turn lane at Orange Grove Rd. Provides a signalized crossing for bikes and pedestrians at the Orange Grove Rd. and Sam Rittenberg Blvd. intersection and at new traffic signal at the Sumar St. and Sam Rittenberg Blvd. intersection. Extends Sumar St. from Sam Rittenberg Blvd. to Orange Grove Rd. including bike and pedestrian accommodations to create additional connectivity. This provides more options for travel in the study area network including a more direct connection for school traffic to Sam Rittenberg Blvd. and additional walking and biking options to access residences and businesses in the study area. Maintains full access in all directions to Southgate Dr. Improves the level of service for vehicles at the Orange Grove Rd. and Sam Rittenberg Blvd. intersection.